eleQtra is active across all main infrastructure sectors. eleQtra professionals have been involved in the development, project financing, construction, operation and divestitures of over 10,000MW of projects across all technologies including gas powered combined cycle, hydro, wind and solar. eleQtra have participated in ground breaking projects in Africa such as the 1,200 MW coal fired power project in Morocco, 100MW methane project in Uganda, 200MW gas fired power project in the Ivory Coast and the first utility size wind farm in sub-Saharan Africa, the award winning Cabeolica project in Cape Verde. 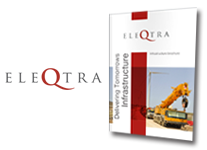 eleQtra develops and manages investments in projects across all transport sub-sectors including airports, ports and harbours, inland waterway transport systems, rail and road. In its capacity as Principal Developer of InfraCo Africa, eleQtra developed Chiansi the award winning bulk irrigation project in Zambia. The project will provide urgently needed low cost, reliable and efficient thermal power to the deregulated Ghanaian power market.